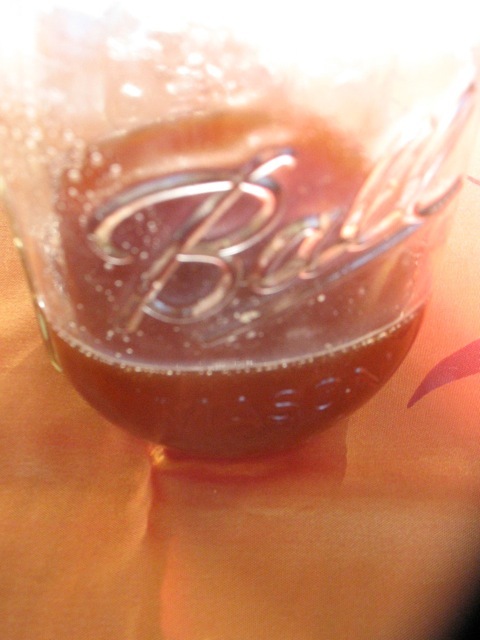 Apple cider cooked down to a syrup. Spectacular in salad dressings, cocktails, etc. I started using a teaspoon or two in salad dressings and I was hooked. The stronger winter greens this time of year are perfectly complemented by this “mystery” ingredient in the dressing. Countless times people have asked me what was in my salad dressing and a friend now can’t make big enough salads since her 8-year-old eats practically the whole bowl. I have to admit this has not worked with my 4-year-old . . .. This syrup also inspired the Party Class I co-taught with cocktail wizard Scott Taylor this last weekend. He encountered the syrup in a Beans Class (that by the way I’m teaching again with new recipes January 7th) earlier this fall and immediately went home and started mixing drinks with it. It is a winner mixed with bourbon, ginger syrup, bitters and lemon! 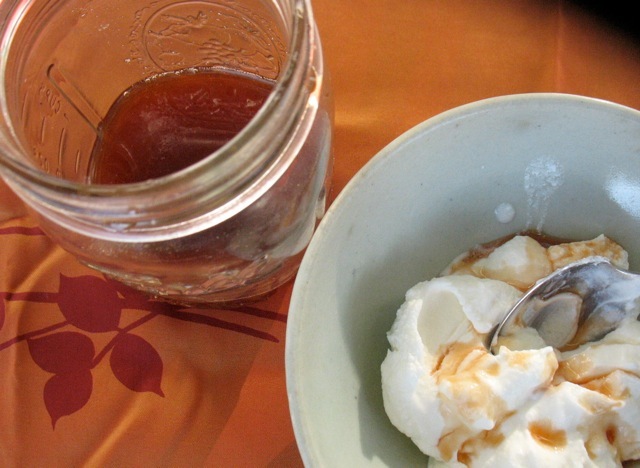 Cider syrup over Greek yogurt. Beyond salads and cocktails the syrup is wonderful over ice cream or Greek yogurt, drizzled onto soups or braises or roasted vegetables or fruits, on pancakes or waffles. . .. It’s sweet and tart and complex and contributes almost anywhere. So go buy a couple of gallons of apple cider, reduce it and give your friends who like to cook and drink a little jar or it as a gift. Or just make a bunch and freeze some. It also keeps well in the fridge for several months. And speaking of gifts, you might also give the gift of a cooking class (to yourself or others) this season– a gift that doesn’t clutter anyone’s home yet makes a daily difference for the tummy! In a large pot or saucepan bring the cider to a boil. Let boil, uncovered until gallon has reduced to approximately two cups of syrup and consistency is thick enough to coat the back of a spoon. This can take anywhere from 40 to 90 minutes depending on the size of your pan, the strength of your stove, etc. Refrigerate or freeze when cool. I did this a month or so ago. It was easy – it just required being around the house to monitor the pot once in a while. I made some dressing with it this week and it was outstanding! My other favorite ingredient for dressings is maple syrup – same idea but a different flavor. I’me reducing mine in the oven set at about 200 degrees with the convection fan on. This is after I boiled mine down to a hard lump – sadly past caramelization – on the wood stove last week. I made the mistake of leaving it on the stove when I was sleeping. : ( So far the oven method seems foolproof – not too hot to burn, but reducing the liquid nicely.